Now Aurora’s only friends are groupies of the undead and the only boy she can think about may very well be a vampire. And if he’s a vampire, she’ll have to kill him. Nikki Jefford has amazed me. Again. 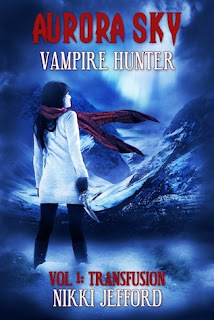 In her newest novel, Aurora Sky: Vampire Hunter, Jefford turns vampirism into a real disease. The explanation that people with the blood type AB can become vampires by extracting a deadly disease (and surviving it) is pure creative genius. I admire that Jefford gave vampirism a new back story, making it a possible realistic occurrence. Aurora Sky, the main character of the novel which is told in her point of view, is a simple teenage girl who dies in a car accident. After learning of her rare blood type, the government steps in, replacing a few organs, infecting her with an array of deadly diseases, and then giving her an antidote so she won't turn into a vampire... but instead become their worst enemy. 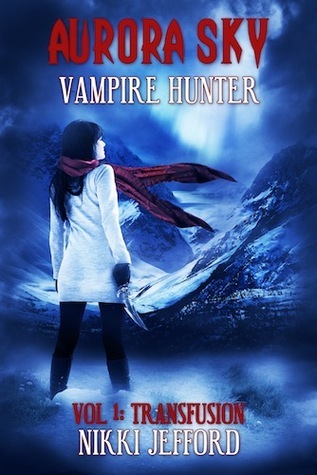 After the transfusion, Aurora is trained as a vampire hunter which is a lot like being thrown to the wolves. And then, of course, is on the job training with her mentor Dante. All of this happening while Aurora is trying to finish high school, falling in love, and making new friends. Talk about a heavy burden! But Aurora can definitely handle herself. After the government made her superhuman, her personality shifts into your typical badass. She's not afraid of anything and is learning to stick up for herself (and others). Though, it does tend to get her into trouble. Readers will connect with Aurora based on her new found teenage angst to live her own life, her desire to be a normal girl even if it's impossible now, and her dreams for the future. Ooh! Nice to see a good reading. I'm going to start this tonight so I could post up my review soon. I'm looking forward to it.